High Polished Stainless Steel Letters with adhesive back fit on top of your dull factory stamped Valve Cover letters. 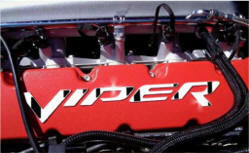 Two "VIPER" words (10 piece set) one for each side of the engine. Really brightens up your engine and gives it a professional show car look.